The session will offer a seminar on turf replacement plants featured in the demonstration at the Garden of the Seven Sisters. Gardeners hoping for sustainable ground covers will learn about eight different kinds of ground covers/grasses that take little water or mowing and are disease resistant and amenable to foot traffic. And they look good, too! The ground covers are planted in 3 different blocks, which will all be on three different irrigation schedules in the future. These grasses may be mowed to resemble lawn or left unmown for easy care. 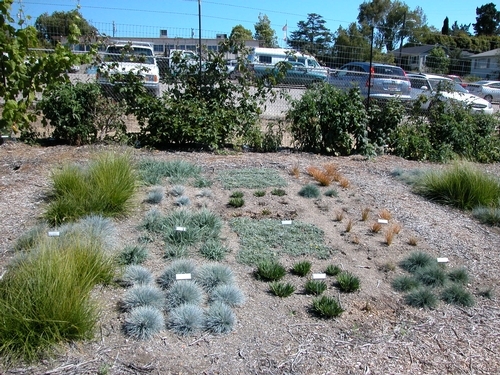 Four of these turf replacements are native to California and four are chosen from other Mediterranean climate areas. 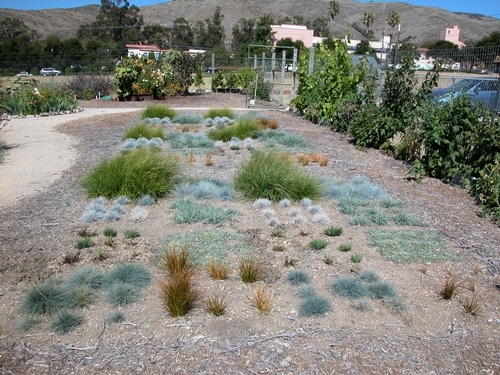 All provide attractive alternatives to a conventional lawn. Fall is the best time to plant these new ground covers. As your vegetable garden winds down summer production you may wonder what vegetables you should plant next – or perhaps you’re planning a season of rest and wonder how to put the vegetable garden to bed for the winter. Another section of Saturday’s presentation will focus on vegetables, showing what winter veggies can be started or planted now. It will also describe the list of chores for fall in the vegetable garden. The free Advice to Grow By presentations are held from 10-12 at 2156 Sierra Way in San Luis Obispo. Come prepared for changeable weather and bring a chair if possible. Click here: For more information about the garden turf alternatives. I own property near the mission that used to have a lawn in front. (many years ago). Obviously you can not water a lawn of this size economically or for that matter ecologically. I talked to one gardener who suggested a low water solution but it would still increase my water bill from the base. Is there a ground cover that requires no watering that would low good?